I was reading the new issue of Modern Bride and I just stumbled upon these fabulous pre-assembled wedding welcome baskets from Navy & Lavender and I'm in LOVE! 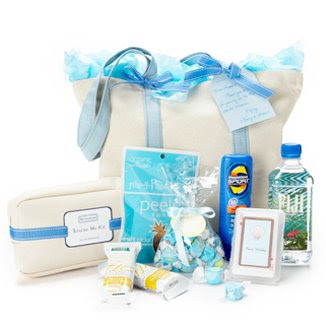 They have bags in all different themes and you can pick the tote handle colors and the tissue color to coordinate with your wedding. If these are out of your budget to give to each guest at your wedding, they really would make a lovely treat to give your bridal party. I know I'd feel so special to receive one.... Love them!